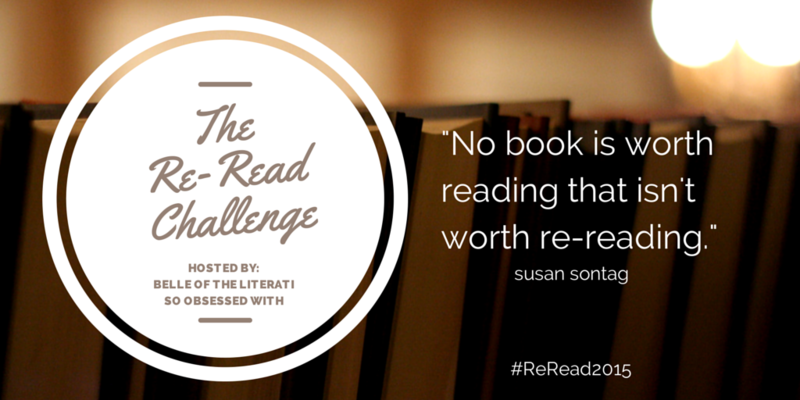 It’s almost the new year, and you all know what that means: new reading challenges! I’m going to make my reading challenges pretty low-key this year because it’ll be a time of huge transition for me (I’m graduating high school in the spring and entering college in the fall!) but I couldn’t resist joining in on the Re-Read Challenge for 2015 hosted by Belle of the Literati and So Obsessed With. I’m not setting a numerical goal for this one, mostly because I don’t want to feel pressured to re-read just for this challenge. I think this will be a great way to incorporate the books I do end up reading into my regular blogging schedule, which should be a lot of fun. The following books are not a TBR list, but rather some of the books that I have regularly re-read in the past or have recently read and would like to re-read in the new year. I’m so excited for this year’s reading adventures! To sign up for this great challenge, click here to go to the sign up post. Let me know if you decide to join! Have a fantastic day everyone, and happy reading!